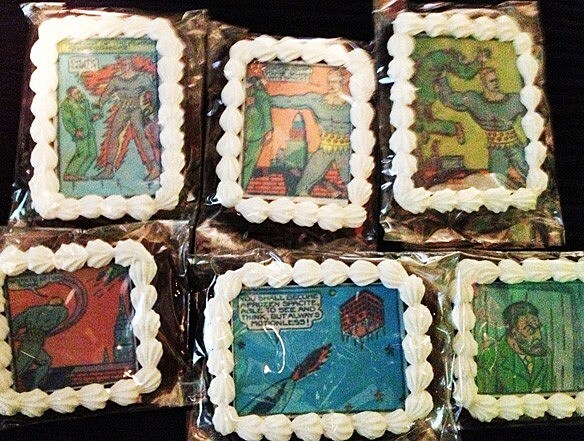 A while back, I wrote about a Kickstarter for the Golden Age Bakery, a business in Chapel Hill built around making edible versions of classic Golden Age comics by printing them on cookies. I can think of no better cause. In that article, I mentioned that I'd really like to see a set of cookies featuring a story by the relatively obscure (and legitimately insane) Fletcher Hanks. 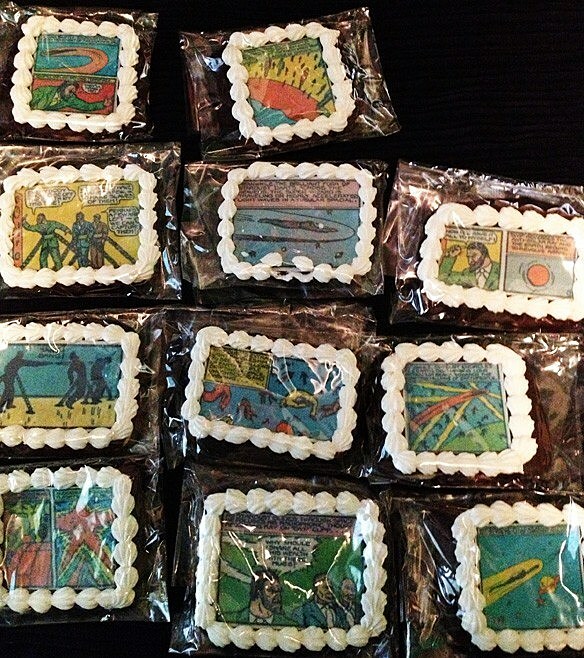 This week, to my surprise, the Golden Age Bakery's Sylvia Toth delivered, and I got an entire Stardust the Super Wizard story reprinted in delicious cookie form. And now, I never want to read comics any other way. Before we go any further, I just want to assure everyone that yes, these things are very, very tasty. Part of Sylvia's goal with the Kickstarter was to expand into using dark chocolate in her cookies, and the end results are well worth the investment. The cookies themselves are plain sugar cookies, and the chocolate is used to hold the panels on. I'll be the first to admit that I don't usually care for sugar cookies or dark chocolate, but seriously, these things are great. As for Stardust, well, if you're not familiar with him, he's a character created by Fletcher Hanks in 1939 in a series of stories that didn't quite have a grasp on things like story structure, human anatomy, or basic logic. Stardust himself was an eight foot tall, suspiciously Caucasian alien who came to Earth to battle crime with his... well, super-wizardry, I suppose, which was pretty nebulous. Probably the best (and most well-known) example is that one time that he confronted a gangster, caused the gangster's head to swell up and his body to shrink and be absorbed into his head, then threw the head out into space to another planet where it was eaten by the gaping hole on a headless monster's shoulders. I've been tempted to pull out my copy of I Shall Destroy All The Civilized Planets and put the cookies into their proper reading order, but every time I try, I end up eating a few panels. Fortunately, this doesn't make the story make any less sense. Seriously. These are the best cookies ever. For more, check out GoldenAgeBakery.com!